Century Park Associates is excited to kick off National Assisted Living Week 2017 with Grandparents Day. The following is a beautiful depiction of the theme of NALW, Family is Forever, as well as a tribute to grandparents. We are thankful for all the grandparents in our buildings, as well those who have stepped up to fill in as grandparents when needed. “Through thick and thin, there will always be family, above anything else,” shares 90-year-old Lillian Roll, a resident at The Bridge at Ooltewah, Tennessee. Lillian smiles at the lady next to her, 95-year-old Selma Bird, Lillian’s sister, best friend and neighbor at The Bridge. The two have been friends their entire lives. And, while not always close in proximity, they both agree that their friendship has only grown stronger through the years. “We were just a close family all the way around,” shares Selma. At an early age, their parents instilled in them a great loyalty to family, taking in relatives and making sure each one was provided for. The family extended their spirit of generosity to those in their community, as well, often giving produce from their large Nebraska farm to those in need. While their parents managed the farm, they encouraged Selma and Lillian to pursue a teaching profession. Each sister earned a graduate degree in education, and both have had successful and illustrious careers as educators. From Alaska to Japan, they’ve spanned the country and globe instructing youth. 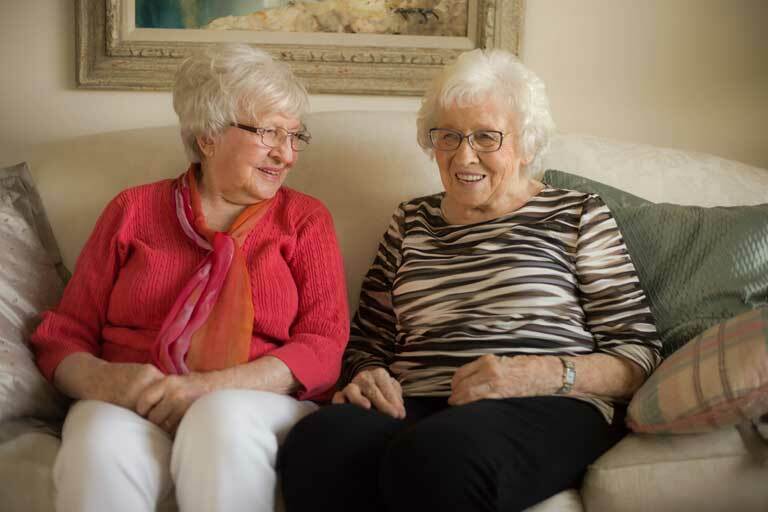 While these endeavors and their husbands’ careers separated the sisters for a majority of their adult lives, they were finally reunited in Orlando, Florida, as they approached retirement. The two eventually moved to Ooltewah together and, with the help of their families, decided to make The Bridge their home. This gave them an opportunity to continue to build their close bond as sisters in a different way. Lillian’s two children, six grandchildren and 14 great-grandchildren have found a second grandmother in Selma, who tragically lost her only son. The large family has remained close over the years, recently congregating at The Bridge to celebrate Selma’s 95th birthday and Lillian’s 90th. Lillian’s son, Ron Hagen, and daughter, Jean Lomino, helped orchestrate the parties. Residents and staff, who refer to Selma and Lillian as “the sisters,” were invited to the celebrations, keeping to the family’s generous and inclusive spirit. “Here at The Bridge, if you see Selma, you know that Lillian is nearby,” shares Bridgett Dallas, Lifestyle Services director at The Bridge. Hagen says the trademark of the sisters is their loyalty. That loyalty has crossed thousands of miles, spanned nine decades and come to include numerous individuals, some related and some not. It’s a loyalty that wholeheartedly exemplifies the idea that family truly is forever.